The City of Chicago is known nationally as a leader in brownfield redevelopment. One of the City's recent accomplishments is the clean-up of a former illegal dump site located near the City's west side at 445 N. Sacramento. The site contained a 34,000 square foot building that was structurally sound but required renovation before it could be put back into use. The City decided to retain ownership of the building and to renovate the building. However, rather than just simply renovating the building using traditional methods, the City of Chicago's Department of Environment seized the opportunity to create an energy efficient building using the highest standards of green technology available. The Chicago Chapter of the American Institute of Architects Committee on the Environment formed a design team for the project. The environmental features of the building include: solar panels, rainwater collection for irrigation, recycled building materials, smart lighting, a green roof, and a geothermal exchange system. Tenants who occupy Chicago Green Tech provide environmental products and services. Greencorps Chicago, the city's community landscaping and job training program, Spire Solar Chicago, a manufacturer of solar panels and WRD Environmental, an urban landscape company. The Chicago Center For Green Technology achieved a U.S. Green Building Council LEED (Leadership in Energy and Environmental Design) Platinum rating. LEED addresses environmental construction and operation through five categories: site design, energy efficiency, materials and resources, indoor environmental quality, and water efficiency. 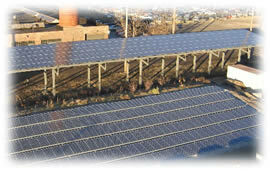 The photovoltaic system was installed in phases over a period of three years. The total capacity of this installation is now 115.2 Direct-Current kilowatts or 96.7 Alternating-Current kilowatts, making it the largest photovoltaic system in Illinois at one location.